For years I’ve luxuriated in playing games and working on my computer in the most cave-like settings I can muster. When I watch a movie on my home entertainment system, I generally turn off all the lights and crank up the sound, in the hopes of evoking that theater-like experience. Basically, the closer I get to pitch black in the room, the better. Unfortunately, starting at a screen for extended periods of time in a darkened room is highly conducive to getting eye strain, and considering I spend more time looking at a screen than not, it’s an ailment I suffer from frequently. Of course, flipping that wall switch might cast a glare on that screen which also causes eye strain- what to do? 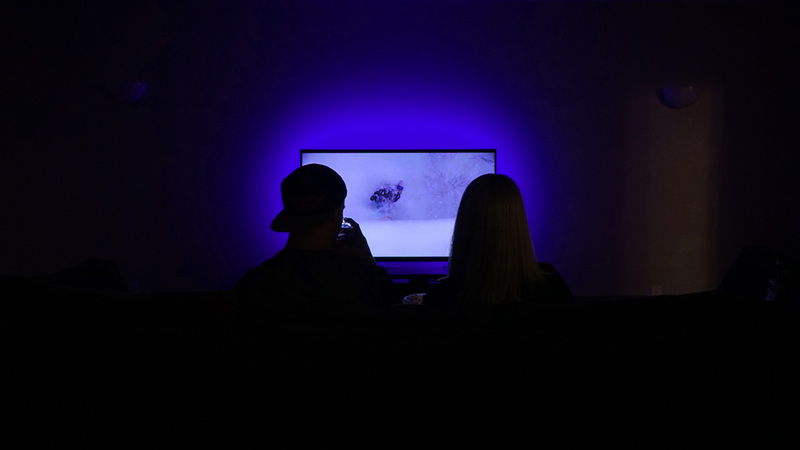 For the last couple of years I have been backlighting my television set with the basic white Ikea Dioder strip to a decent effect, but recently I got to try out Power Practical’s Luminoodle Color Bias Lighting, and the difference is stark. Unlike the Dioder, which is a segmented rod of lights encased in hard plastic, the Luminoodle is a flexible adhesive-backed strip which can follow the contour of the back of your TV set or monitor. Instructions are provided depending on what size set you have, and there are three different sizes of Luminoodle to choose from: 1M (for TVs and monitors up to 30”), 2M ( up to 55”) and 3M (up to 70”). My set is 55” and the 3M strip was able to hug the edge of the top and both sides, with plenty of slack for it to be plugged in. The included instructions provide great guidance for how you should configure the strip based on your TV size. Each of the LEDs pokes out from the strip, making it somewhat prickly to the touch. A bit of a nuisance, but considering how little I touch the back of my television, not really a big deal. The strip is powered via USB (input is 5W(5V,1A)), which I plugged into my TV, but it can also be plugged into your cable box, game console, wall adapter, PC, etc. The advantage of using the USB port on the television is that the lights power on with the set, though there are also rudimentary controls on the strip for power and mode cycling, as well as an accompanying remote, which was instantly responsive from my couch. Installing the strip was a breeze, and I really appreciated how self-contained it was once it was plugged in, making it more like a part of my set rather than something that I attached to it. Once I lifted my TV back into place in my entertainment center, I turned off the room lights and started off with some light channel surfing. Immediately I noticed how the backlight was much more even and brighter compared to the Dioder I replaced- 450 lumens really makes a difference. The Luminoodle has 10 dimming levels, 15 colors, and a speed adjustable setting that cycles through all of them. After a little while, I settled on a nice violet with the dim set halfway as a default, though much fun was had with what I dubbed ‘disco mode’, a fast cycle through the different colors that brought a little something extra to a quick Rock Band session with my kids. All in all, after a couple of weeks of movie watching and game playing, I can’t be more pleased with the Luminoodle Color Bias Lighting strip. The ambient light is a big improvement over my previous backlighting and the automatic power on/off with my TV ensures that I use it every time. With a price range of $20-30 (depending on size), I’m seriously considering getting one for every stationary screen in the house.